Harvest finally started on our family farm last week. This is one of our family's absolute favorite times of the year. And although it is not going quite as planned with some rain and fog the last few days, we are so excited for harvest to be here. 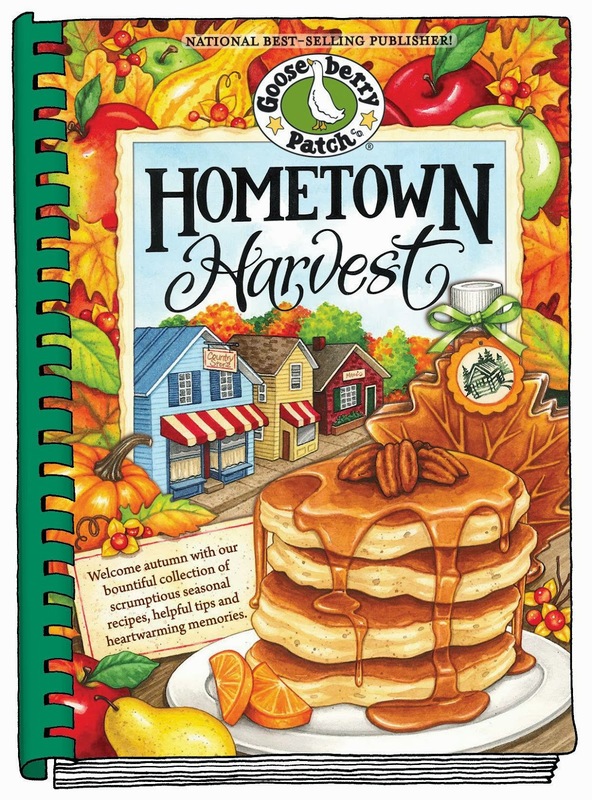 So when Gooseberry Patch's Hometown Harvest cookbook arrived a few weeks ago, I was super excited to start cooking some new recipes that are perfect for the harvest season. So far, we made Fried Corn Chowder and Beer Bread from the Church Social Soup Supper section. and Layered Potatoes & Onions from the Slow-Cooker Potluck Pleasers section. And this is just the start. 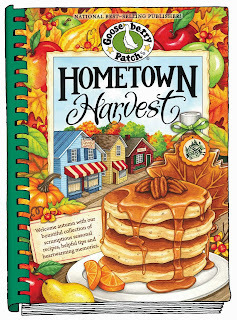 There are several other recipes marked in the cookbook for us to try this harvest season. 1. What is your favorite thing to eat/make in the fall? 2. Which of the above recipes are you most excited to see on my blog? 3. Which recipe would you rather see on this blog: Tortellini Caprese Soup, Brussels Sprouts & Shallots, Turkey Noodle Soup? It really couldn't be any easier. This giveaway will run through October 14th. Good luck!!! Special thanks to Gooseberry Patch for providing me with this great cookbook to try and share with you. If you would like to purchase this or other cookbooks, please visit their store. Additionally, this post does contain an affiliate link. Fall is a great time to try new recipes with all of the gardens harvest at ready in the pantry....I am anxious to try the parmesan pork chop recipe! I like to make Deep Dish Apple Crisp. I like the sound of the Layered Potatoes & Onions. My pick is Brussels Sprouts & Shallots. I would have to say my favorite thing to eat during fall is anything with Pumpkin in it. Pumpkin bread, pumpkin cookies... you name it! The layered potatoes and onions sounds really good, especially since it's a crock pot meal. Annnd I vote for Turkey Noodle Soup! I made a new stew recipe with white beans, kale and polish sausage, very good. I would like to see the turkey noodle soup recipe. I like to make big pots of stew and chili in the fall. My favorite thing to eat in the fall is pumpkin pie. I know you can eat it year round but there is something about eating it in the fall that makes it actually feel like fall. Hands down it would have to be Brussel Sprouts and shallots. Excited about the Fried Corn Chowder & love potatoes & onions so I'm interested in the Layered Potatoes & Onions in a slow cooker. I usually just fried them up quick in a cast iron skillet. I love anything with apples or pumpkins in autumn. I am excited to try Fried Corn Chowder and the Turkey Noodle Soup would be very interesting to try. I've made a ton of Chicken Noodle Soup and even though we always have way too much turkey leftovers after Thanksgiving, I never thought of soup. The fried corn chowder looks delightful, but then so does the potatoes and onions. I love cookbooks. I love making soups when the weather chills! I'd love the Tortellini Caprese Soup recipe! I came to this page because the fried corn chowder and beer bread sounds so good! My favorite thing to make in the fall is apple dumplings with vanilla sauce from apples picked at the local orchard. I love Brussels sprouts, so the recipe with shallots would be one I would be interested in trying. I love apple crisp. Thanks for the chance to enter. The Parmesan pork chops look great. Thanks for the chance to enter. I would love to see Turkey Noodle Soup. Thanks for the chance to enter. Love fall cooking and love making beef stew. Would love to tey the parmesan pork chops and see the turkey noodle soup recipe. Love homemade soup in fall too. Yum!!! I like baking anything with chocolate! This new cookbook looks fabulous! My favorite thing to make in the fall is an apple cranberry pumpkin butter that I developed. It tasted like autumn in a jar. 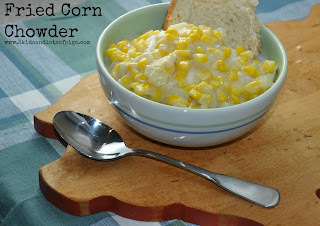 I would really like to see the corn soup recipe as my guys are big fans of corn chowder. Thank you! Hands down would love to see the Tortellini Caprese Soup recipe as we thoroughly enjoy caprese salad in our family. My favorite family recipe for the Fall is Applesauce Cake made with homemade applesauce. It really makes the house smell so good while baking. I like soup of any kind and the Turkey noodle sounds so tasty. I love pumpkin bread in the fall! I am most excited to see you publish the corn chowder! On this blog I want to see the Turkey Noodle soup! I would love to see the Brussel Sprout recipe....love Brussel Sprouts. 1. I keep it simple but good. Hamburger patty, mashed potatoes and sweet corn. 2. Definitely the layered potatoes with onions. I really love potatoes. Would love to try them. 3. No doubt in my mind; turkey noodle soup. I like to make apple pie in the fall. I would like to see the recipe for Layered Potatoes and Onions on your blog. I would like to see the recipe for Turkey Noodle soup. 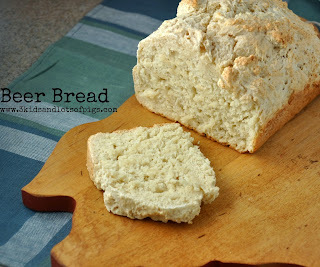 My favorite thing to eat and make in the fall is fresh baked breads - rolls, cinnamon buns, loaves. Nothing makes the house smell better than fresh baked breads. I think he Fried Corn Chowder sounds amazing. I would love to see it. The Tortellini Caprese Soup sounds good. I would love to have that recipe. I LOVE to make Chili in the fall..in fact, made a pot today! Toss up between Beer Bread and Parmesan Pork Chops! Yum! I vote Turkey Noodle Soup...yum! Fall happens to my favorite time of the year too - and time to get back to what my family calls "real cooking," which in my house means we turn back on the oven and bake! My favorite things to bake in the fall are casseroles. I especially like to cook in large quanities and make freezer meals for conveience sake. With that being said, however, I am curious about the corn chowder recipe you have shared. Not only do we have an abundance of corn put up from the garden, but my kids love corn. Could this be the first soup the Fessel kids agree to eat?!?! I'd also like to learn more about the turkey-noodle soup. I'd love to see the Brussels sprouts & shallots recipe. I love to make pumpkin bread in the fall! 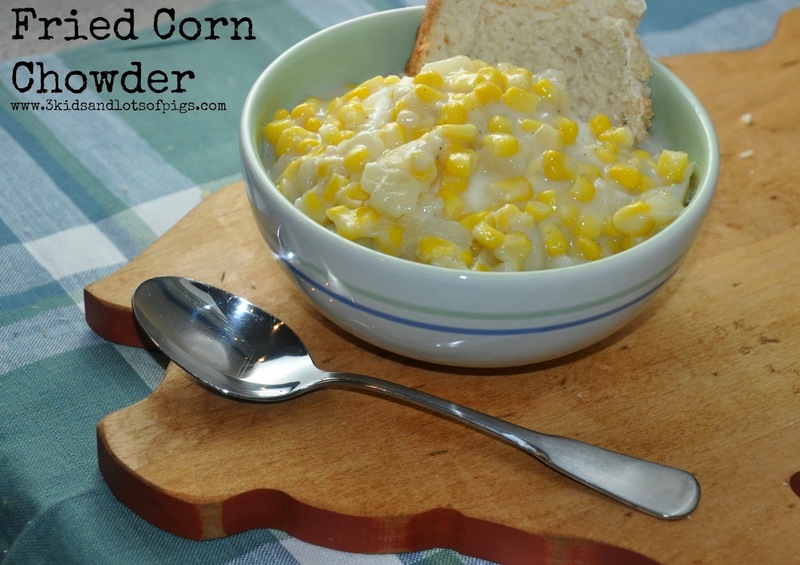 Thanks for posting the Fried Corn Chowder! Looks yummy! I love to make soup and homemade macaroni and cheese in the fall! 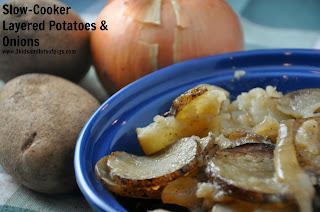 I'd love to see the Slow Cooker Layered Potatoes and Onions recipe. I'd love the Tortellini Caprese Soup recipe. If it's got pumpkin in it I'll cook it, eat it and LOVE it. I love to make peach cobbler no matter what the season is. I also love to see any recipes for pork chops. The turkey noodle soup should be a great recipe for using all the leftover turkey. In our house we are lucky to get a couple sandwiches out of any leftover turkey we have. Usually there isn't any left over! I love to bake in the Fall. I'd like to the Parmesan Pork Chops. I love any comfort food in the fall but a family favorite are my pumpkin bars. 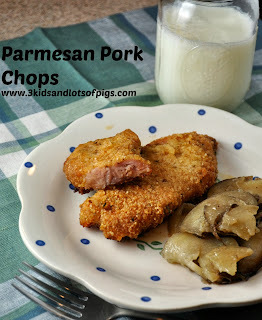 I would like to try the parmesan pork chops, those look amazing. The recipe I would like to see on your blog would be the Tortellini Caprese Soup. I love fall cooking and always look forward to cooking some fall greens as well as sweet potatoes. I'd love to see the recipe for fried corn chowder. Brussels Sprouts & Shallots sound great. My favorite thing to eat/make in the fall is chili! I'm most excited to see the Parmesan Pork Chops recipe on your blog! The recipe I would rather see on this blog is Brussels Sprouts & Shallots! Those all look wonderful! The fall food I most anticipate is homemade pumpkin pie, but chili mac is always good for warming up on a chilly day too. I'm excited for the fried corn chowder and beer bread recipes. They both look delicious, and I'll bet they go together well. I'd love to see the Brussels Sprouts and Shallots recipe on this blog. I love Brussels sprouts when they're cooked right, so I'd love to get an idea of a tasty way to cook them! Always enjoy reading a new cookbook. This one looks great. Pumpkin Breads of all kinds are my favorites. I love their cookbooks. I enjoy all the recipes in your cookbooks. I hope I win this because that is one of my hobby-collecting cookbooks. My favorite fall food is apple cider donuts.